How to convert FLV to Xbox with Xilisoft Video Converter? Current Page: Xilisoft > Video Converter > How to convert FLV to Xbox? As professional video converting software, Xilisoft Video Converter can also act as an FLV to Xbox Converter which can convert FLV to Xbox with ease. The FLV to Xbox Converter supports batch conversion, multithreading. 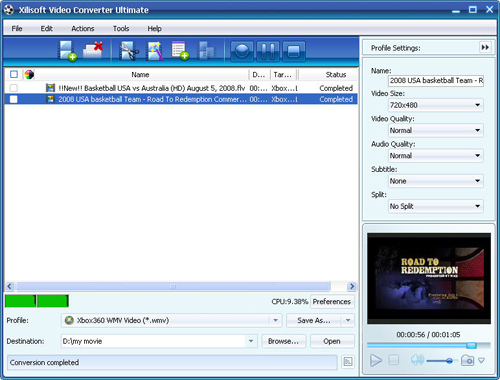 When convert FLV to Xbox, you can select the video and audio codec, set the output parameters. You can download it for Free Try FLV to Xbox Converter. In addition, the FLV to Xbox Converter can convert between other video and audio formats such as MP4, MOV, 3GP, M4A, MP3, AC3, etc. Now let's focus on how to step by step convert FLV to Xbox with the FLV to Xbox video converter. 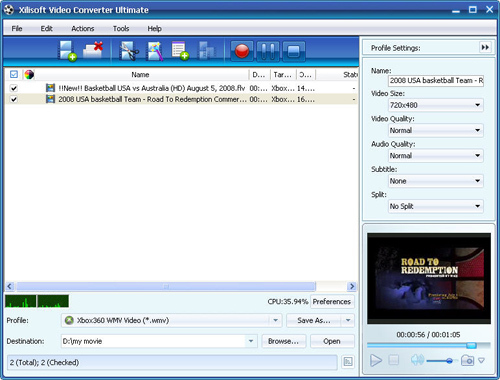 Launch Xilisoft Video Converter, add your FLV file by clicking "Add" in the File menu or in the main interface. By highlighting the FLV file, you can see its info including video codec and audio codec in the recording area. In "Profile" drop down list box, you may select output format: Xbox. The software allows setting different output formats according to different files. The FLV to Xbox conversion is so simple! Now, don't hesitate! Come and buy this powerful FLV to Xbox converter to play any video on various devices. How to convert videos to Xbox? How to convert YouTube videos to Xbox? How to convert M4V to FLV? How to convert FLV to iPad with Xilisoft iPad Video Converter?